robertcop, a photo by willlaren on Flickr. this is a drawing I did for my friend Jee-Shaun's upcoming zine about the apocalypse. 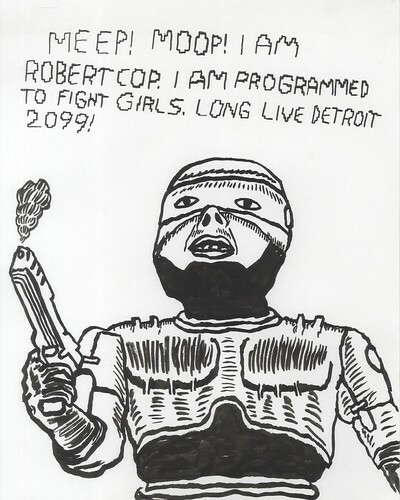 technically the world of Robocop is more of a dystopian future but I'm hoping people will cut me some slack. HAHA. HAAA... ohhh... classic. That's good. Hey sorry I missed your fundraiser man, I was your biggestish fan the other month, couldn't get enough of ya! Then some things happened and I kind of forgot about you... just now I rememberered about you but couldn't remember your name so I trawled through 280 pages of the wooooo blog to find you. Plus I was too scared of nigerians to do online shopping until the other day, now I'm buying shiz all over the shiz! Anyway, I guess I missed out. Can I buy anything? Anywhere? Want some money? I REALLY WANT THIS DRAWING, AND OL' SPICY KEYCHAIN. I know I wrote in CAPS but it shows my enthusiasm. DO YOU SELL PRINTS?